In the last article we saw how email misuse leads to enormous amount of inefficiency. The solution was to share files (or any other shareable thing) by keeping a single copy at a central location. In this article, I will explain the solution in more detail. Storing the single copy – where? Where to store the document? The answer is simple. It should be kept in a place which is available to all those who need it and from all places they need it from. On the face of it, there are many solutions available – these are cloud (internet) based hard disks. DropBox, Google Drive and so on. However, I find SharePoint to be ideally suited for business sharing and OneDrive for personal sharing. You store the file there. And then can see it on laptop, mobile, tablet etc. That means sharing has happened across devices and it is location independent. 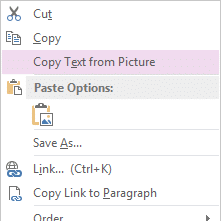 If you decide to share the file with others, you can choose whether they can see or edit the document. This way you can share without making copies. Needless to say, whomever you share with can view it from any location and on any supported device. This is how all the problems associated with email based sharing vanish instantly. Storing a single copy – of what? Although the current discussion is about files – the concept is by no means limited to files. Here are other things of corporate importance which are equally amenable to SharePoint based sharing. 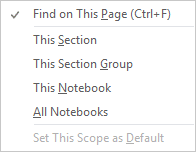 OneNote notebooks shared across departments, project teams, crisis committees, etc. How to access the file if not connected? Although this concept is fairly well known, not many people are using this as a default method of storing documents. We still prefer to create documents on the PC and then upload it to some web based drive. One of the reasons for this is the fear of losing control over the file. If your original file is on the internet and you don’t have a connection (or a good connection), then it is as good as not having the file. This is an unacceptable scenario. But there is an easy solution to it. SharePoint and SkyDrive provide Sync tools for your local PC. Once installed, it acts like a folder on your local drive. You save the files to that folder and it will automatically upload and synchronize the files with the internet storage. This gives you best of both worlds. Central, single shared file and ability to edit when offline. 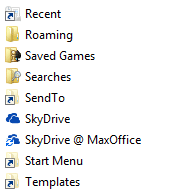 SharePoint and SkyDrive storage does not blindly copy and sync files. 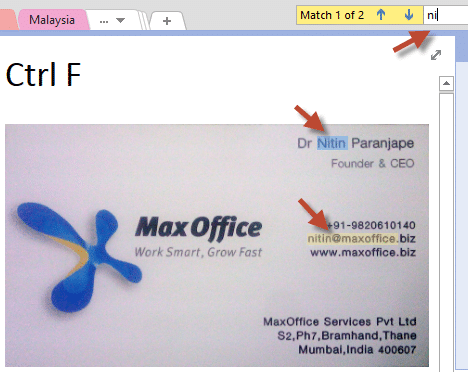 For Office files, it only changes the part of the document which has changed. This way you get faster sync performance and it also minimizes your bandwidth utilization. Try this out and see the benefits for yourself. Does your company have SharePoint? Don’t assume that you don’t have SharePoint. Many companies have SharePoint or Office 365. But often IT does not make it available for all staff members. So it is best to check with your IT team. Ask them if they can create a Team Site for you and then give you administrator permission within that team site. This site can be used for sharing documents, data, pictures, calendars, tasks, links, notes and so on. This is absolutely WRONG. It is a misuse of SharePoint platform. Why is this wrong? Because you already made two copies – one local and one on server. This violates our simple rule = Sharing = 1 copy. Office 2013 makes it very simple to store documents to your SharePoint or SkyDrive folders. The file Save As menu automatically shows the SharePoint site which is associated with your account. This way, without changing the way we save files, you are getting the benefit of centralized storage. 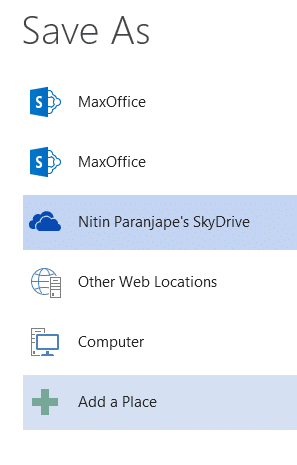 The SharePoint site “MaxOffice” is shown twice because we have two independent SharePoint places mapped here. Look at your day to day work and try finding out files and processes which benefit from this concept of sharing. For a team of your colleagues and try this out. Unless you get the confidence of using the system well, you will not end up using these concepts and continue to send CCs with attachments!